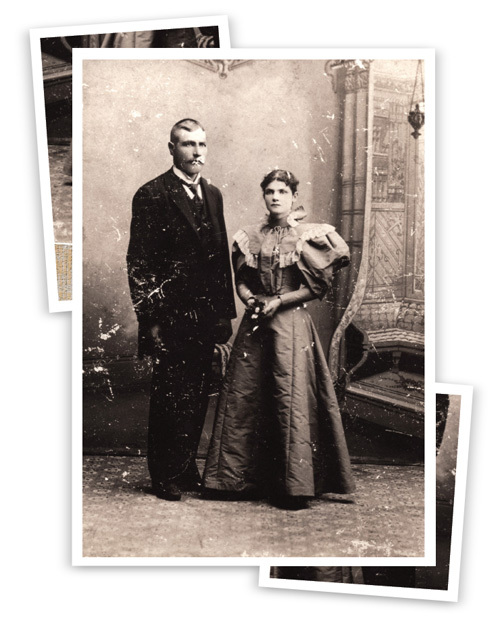 Mary Rapp — a daughter of Mary Gallogly’s great-great grandmother — and her husband, August. Mary decided her portion of the land would not only stay in the family, but that it would only be passed down the female line. All farm land has a story. From the corn it grows and the families it feeds to the animals it keeps, every acre across this nation has a piece of history, a secret within its soil that will live on for years. But for a small plot near Aberdeen, S.D. — with grain that gets sent to POET Biorefining – Groton — the story is a little sweeter than your average acreage of corn and soybeans. It’s intentionally owned only by women within one family, and it has been since the mid-1800s. With careful exchange, the ladies intend to keep it that way for a long time to come. “It’s a wonderful, unique story,” says current owner Mary Gallogly. Today, Gallogly lives with her husband and three grown children in Colorado Springs, Colo. But the story doesn’t begin there. Instead, it begins with Gallogly’s great-great grandmother, Susan Marsh Rapp. After her husband died in the mid-1800s, Rapp made the brave decision to move her eight children out to South Dakota, traveling from Wisconsin in a covered wagon. Bria Gallogly, Lois Gowing and Mary Gallogly with Rick Reber of Aberdeen, who farms the land and delivers the grain from the land to POET Biorefining – Groton. She came to homestead 160 acres of land near Aberdeen and, before she died in 1885, she evenly split those acres among her eight children. The 40 acres that Gallogly owns today was given to one of Susan’s daughters, Mary Rapp, and she’s the one who made the decision that her portion of the land would not only stay in the family, but that it would only be passed down the female line. Today, her word holds true. 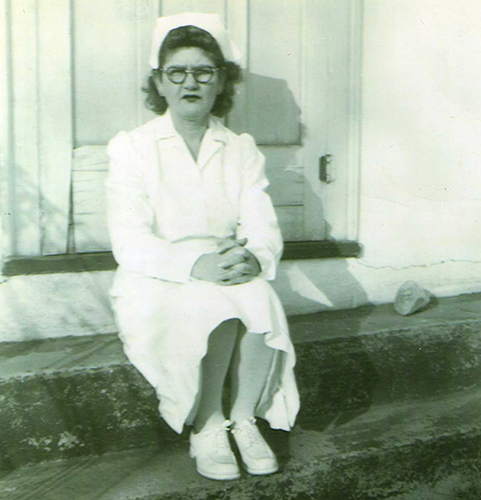 After Mary Rapp’s tenure, she passed the land down to Gladys Pekas Larson, Gallogly’s great aunt whom she lovingly referred to as Aunt Happy. 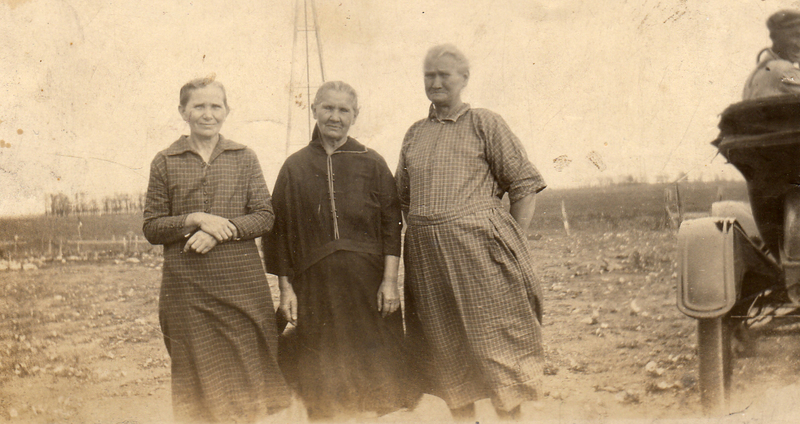 Because Aunt Happy didn’t have any daughters, she turned to her nieces when it came time for her to pass down the land. So from Aunt Happy, the 40 acres was passed down to Gallogly’s mom, Lois Ann Pekas Gowing. Out of all the women who have owned the land over the years, none have actually lived on the land or farmed the land themselves. Instead, they have rented it out to farmers to raise corn and soybeans. Today, that farmer is Rick Reber of Aberdeen, and he’s the one who delivers the grain from the land to POET Biorefining – Groton. “Gladys Larson was the owner when I originally started farming it, around 35 years ago,” Reber recalls. Then, when Gallogly’s mom took over, she and Rick became friends. “My mom was quite close with Rick,” Gallogly says, even noting that the two sent Christmas cards to one another every year. About 10 years ago, Gallogly took her mom out to South Dakota to see the land, and Reber remembers that trip. “Lois had her whole family with her, and she really enjoyed seeing all the farm land,” he says. That was the last time she saw her 40 acres before passing it down to Gallogly. She died this past fall. But Gallogly has already been in touch with Reber, and she looks forward to building a friendship with him, just like her mom did. “Lois and Gladys were both widowers, but they enjoyed keeping the land, and they were great people to work with,” Reber says. From a business perspective, it’s been a pleasure working with POET Biorefinining — Groton as well, Reber says. He mainly hauls grain to them during harvest. Reber also says that having an ethanol plant in Groton really helps to ensure that local farmers get good prices for their corn. And those positive working relationships ensure for families like the Galloglys that their land is in good hands. Even though Gallogly just recently took ownership of the land this past year, her only daughter, Bria, 19, already knows she is next in line. “I’m super excited about it,” Bria Gallogly says. She even considers moving to South Dakota and living on the land when the time comes. “I love horseback riding and have thought about maybe transforming no more than 5 acres to having horses on it,” Bria says. And what a dream for Bria, to ride horses across vast acres that her female ancestors once nurtured, that her grandmother admired, and that her own mother kept safe. “It is empowering,” Bria says. 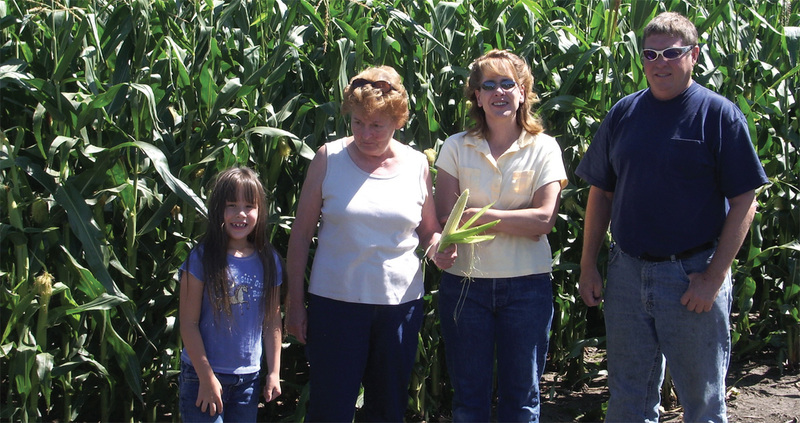 Generations who have owned the 40 acres of land near Aberdeen, S.D. Susan was the great-great grandmother of Mary Gallogly. She was the first to own the 160 acres. Upon her death in 1885, she evenly distributed the land to her eight children. Mary was one of Susan’s daughters, and she inherited 40 out of the 160 acres. She was the one who made the decision that future generations had to leave the land in the family, and it had to be sold only to daughters or nieces. 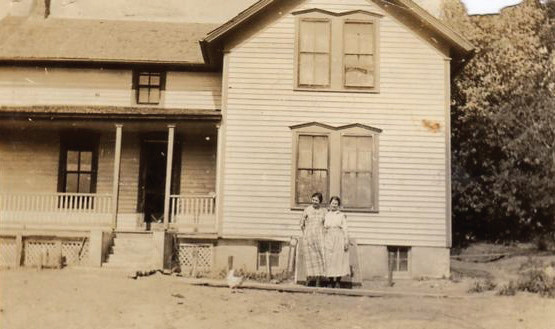 Mary Rapp passed the land down to Gladys, who is Mary Gallogly’s great aunt. Gladys worked with Rick Reber, who still farms the land today. Lois is Mary Gallogly’s mother, and she owned the land just up until this past year. She died in 2016 and passed the land down to her daughter, Mary. Mary owns the land today. Next in line will be her only daughter, Bria Gallogly. Three women on the farm. Mary Gallogly’s great aunt “Happy” (Gladys) Larson who passed the land down to Gladys’ mother, Lois. 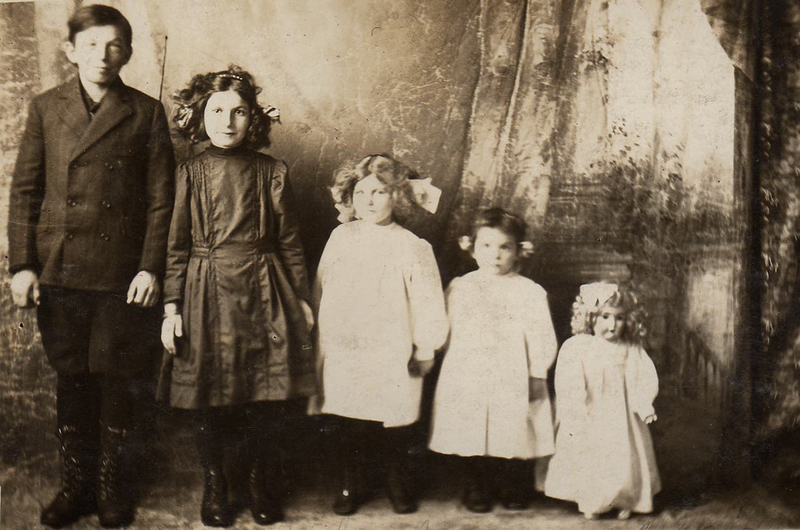 Aunt Happy (second girl from the left) with her siblings, around 1907. Lois Ann Pekas Gowing (left) with her siblings while visiting South Dakota in 1954.